AWS CodePipeline lets you create continuous delivery pipelines that track code changes from sources such as CodeCommit, Amazon Simple Storage Service (Amazon S3), or GitHub. The example in this topic describes how to create and use a simple pipeline from CodePipeline as a deployment tool for code that you run on AWS OpsWorks Stacks layers. In this example, you create a pipeline for a simple Node.js app, and then instruct AWS OpsWorks Stacks to run the app on all of the instances in a layer in a Chef 12 stack (in this case, a single instance). This topic describes how to use a pipeline to run and update an app on a Chef 12 stack. For information about how to use a pipeline to run and update an app on a Chef 11.10 stack, see AWS CodePipeline with AWS OpsWorks Stacks - Chef 11 Stacks. Content delivered to Amazon S3 buckets might contain customer content. For more information about removing sensitive data, see How Do I Empty an S3 Bucket? or How Do I Delete an S3 Bucket?. Before you start this walkthrough, be sure that you have administrator permissions to do all of the following tasks. You can be a member of a group that has the AdministratorAccess policy applied, or you can be a member of a group that has the permissions and policies shown in the following table. As a security best practice, you should belong to a group that has permissions to do the following tasks, instead of assigning required permissions to individual user accounts. For more information about creating a security group in IAM and assigning permissions to the group, see Creating Your First IAM User and Administrators Group. For more information about managing AWS OpsWorks Stacks permissions, see Best Practices: Managing Permissions. For more information about managing CodePipeline permissions, see AWS CodePipeline Access Permissions Reference in the CodePipeline documentation. 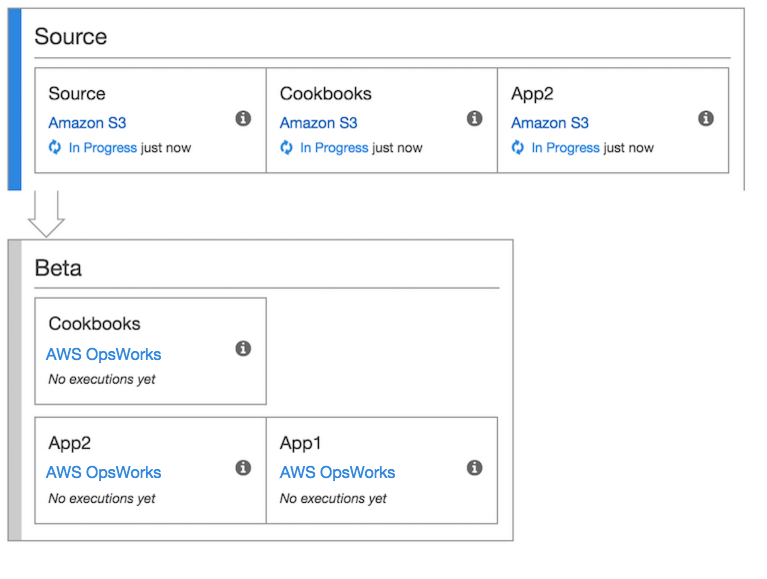 Create and edit stacks, layers, and instances in AWS OpsWorks Stacks. Create, edit, and run templates in AWS CloudFormation. Create, edit, and access Amazon S3 buckets. Create, edit, and run pipelines in CodePipeline, especially pipelines that use AWS OpsWorks Stacks as the provider. You must also have an Amazon EC2 key pair. You will be prompted to provide the name of this key pair when you run the AWS CloudFormation template that creates the sample stack, layer, and instance in this walkthrough. For more information about obtaining a key pair in the Amazon EC2 console, see Create a Key Pair in the Amazon EC2 documentation. The key pair must be in the US East (N. Virginia) Region. You can use an existing key pair if you already have one in that region. You can edit a pipeline to add a Chef cookbook to the Source stage and an associated target for updated cookbooks to the Deploy stage. In this case, you add a Deploy action that triggers the updating of your cookbooks when you make changes to the source. The updated cookbook is deployed before your app. For more information about working with CodePipeline, see the CodePipeline User Guide.